Venture out to our most northerly Scottish campsite in the Western Highlands. Our campsite is an oasis of peace and calm. This pretty tree-lined site enjoys glorious views that extend over Loch Ewe. Catch the weather right and the sunsets from here are sublime. The site has toilet and shower facilities, a laundry and backpacker facilities. For provisions the village of Poolewe, a short walk away has a good shop, as well as a tearoom and hotel. Our Inverewe Gardens Club campsite shares its name with the world-famous tropical Inverewe Gardens created by Osgood Mackenzie in 1862. This lush oasis perches on a peninsula at the edge of Loch Ewe surrounded by more than 2,000 acres of conservation estate. 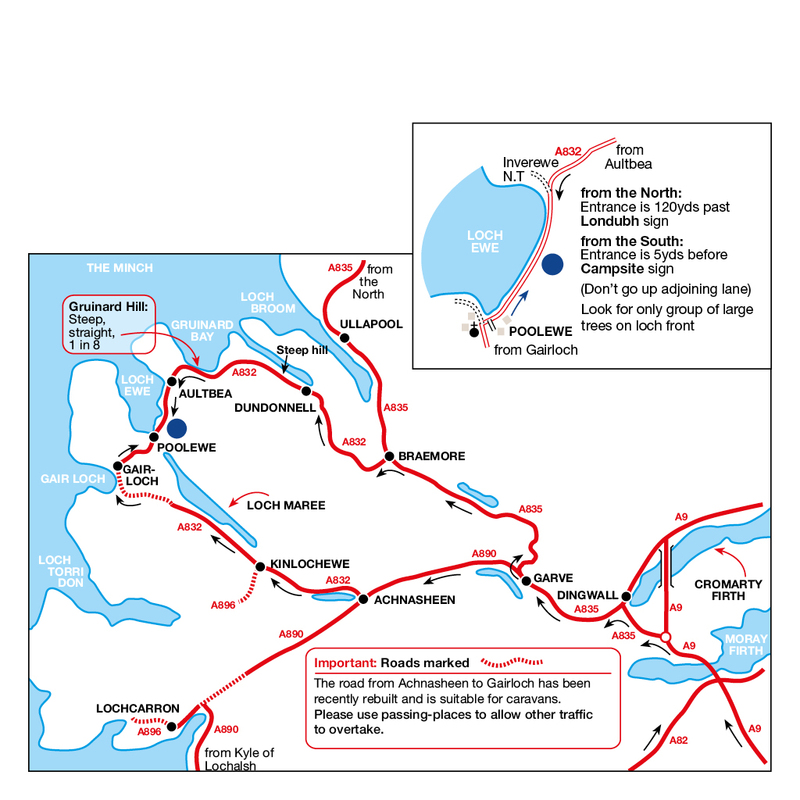 There are plenty of walks to be enjoyed from site or cycle to Inveradale around the Loch. Further north Rubha nan Sasan, beyond Cove is home to a range of WWII command posts and gun emplacements which helped guard the entrance to Loch Ewe during the war. Nearby Gairloch has a heritage Museum and Marine Life Centre offering daily cruises to survey dolphins, whales and seals. Recommended approach to the site is from Gairloch side due to steep hill from Ullapool direction. Poor satellite signal, TV from most pitches, Vertical aerial needed. Fuel available at Gairloch on a Sunday, card payments only. Gairloch pipe band play some evenings on site during summer months. Poolewe Hotel serves food in the evenings and at lunchtime. Café in village and at Inverewe Gardens. Often described as one of the most beautiful gardens in Scotland, Inverewe Gardens is set on the edge of Loch Ewe and is teeming with exotic, diverse plant-life. Explore the historic botanical gardens and keep one eye on the loch for a glimpse of wading birds, pine martens and otters. Based in the North-West Highlands, Gairloch Heritage Museum takes you on a tour through the history of this village, its people and their culture. Wander across the Victorian suspension bridge that crosses the River Droma and marvel at the rushing water as it plummets down a series of dramatic waterfalls. This is also a great spot to glimpse bird-life, including golden eagles, which can sometimes be spotted soaring above the gorge. One of the Highland’s most picturesque attractions, Eilean Donan Castle is a 13th century fort situated on an island where three, great lochs intersect. When exploring the grounds, it’s not hard to see why this fairy-tale fortress provided inspiration for the Disney Pixar film, Brave.